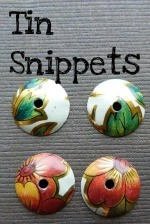 I was finally able to spend some quality time and create a tutorial to make these printed tin bead caps. In this tutorial, you will receive some great tips and tricks to cutting up a tin container, and which tools are necessary to create bead caps. I include a comprehensive materials list, photos, instructions, tips, and links to videos. The videos are a great source of knowledge, it's always great to see how it's done! The links will bring you to my video page where you will need the password to view the videos. The passwords are included in the pdf. This PDF is downloadable, and printable. *** PDF will be downloaded right from my Indiemade sitet*** Payment will be processed by PAYPAL. All of the examples, photos, text in this eBook are copyright owned by Lorelei Eurto. This course is for personal use only. You will need specific supplies for this course. All tools and materials are listed, as well as tips on where to buy these materials.